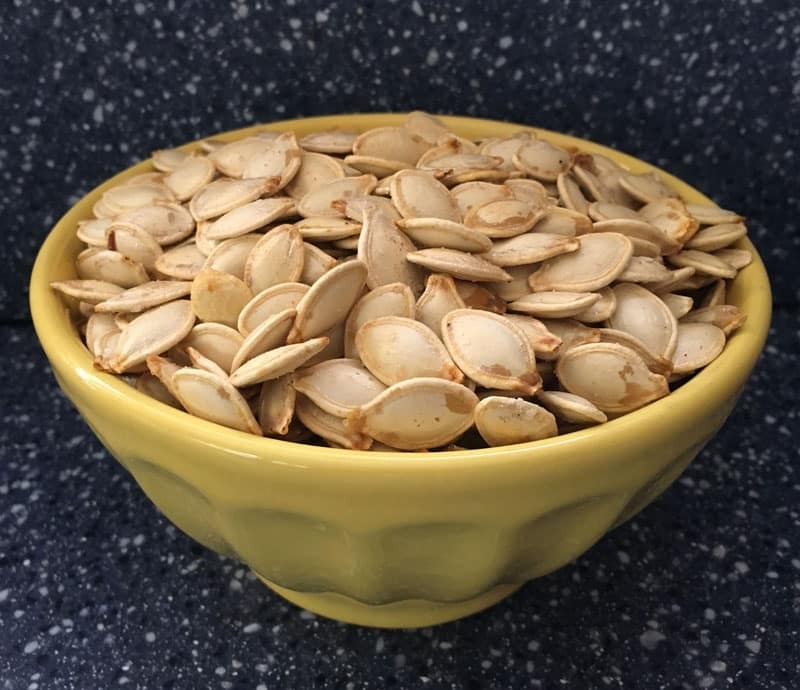 Whether you grow pumpkins in your garden or carve them for Halloween, this recipe for easy roasted pumpkin seeds makes a crunchy, nutritious snack. Have you ever been to a fancy restaurant that puts roasted pumpkin seeds (also called pepitas) on a salad or soup? They’re not just a tasty garnish, but are a healthy snack too. 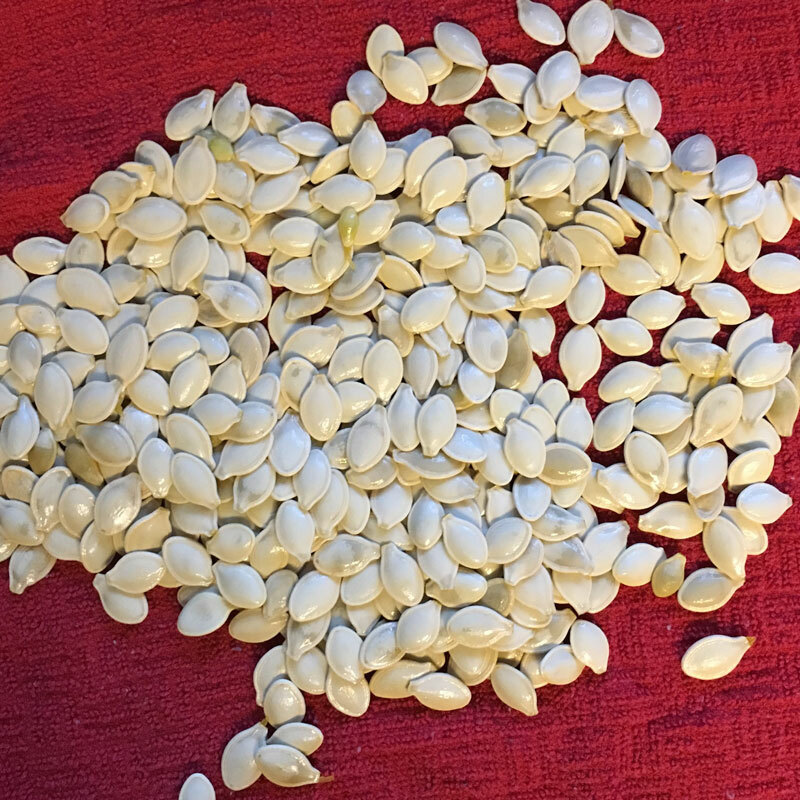 Roasted pumpkin seeds are crunchy, delicious, and are packed full of nutrients. They’re high in fiber and protein, and also contain minerals like zinc, manganese, copper, and phosphorus. 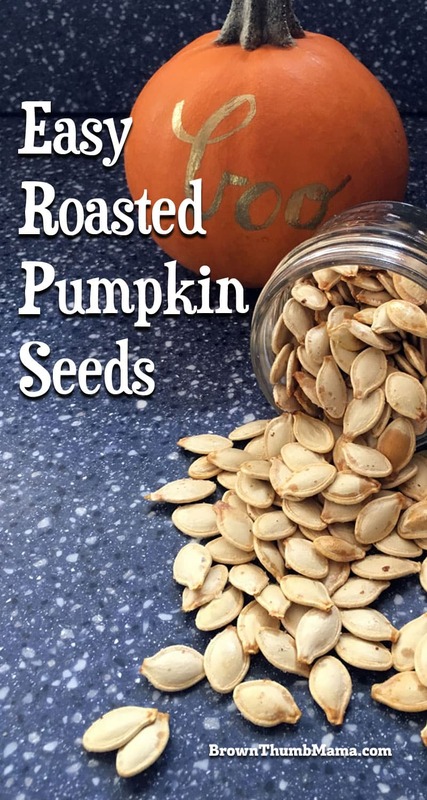 And best of all, if you’re harvesting pumpkins from your garden or carving them for Halloween, you’ll have lots and lots of pumpkin seeds that you can use for this easy roasted pumpkin seed recipe. Pumpkin calligraphy by the lovely and talented Lara Kinris. 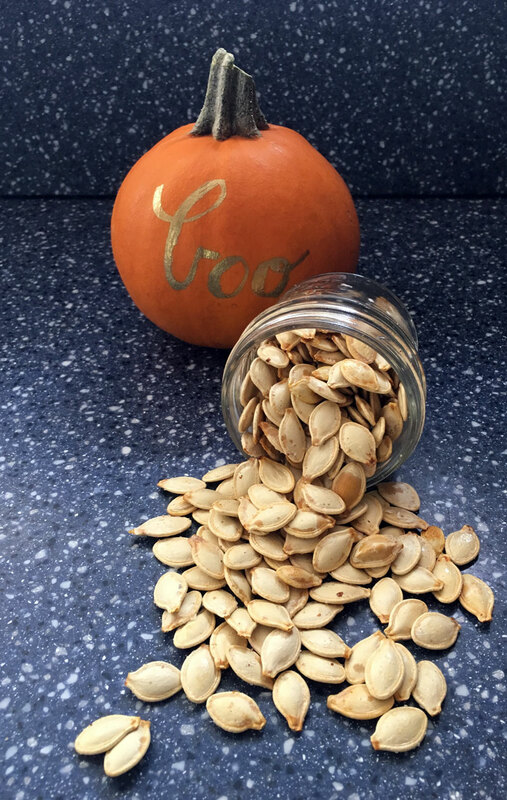 Here’s an easy recipe for roasted pumpkin seeds that you can use as a tasty garnish or to eat all by themselves. Happy snacking! 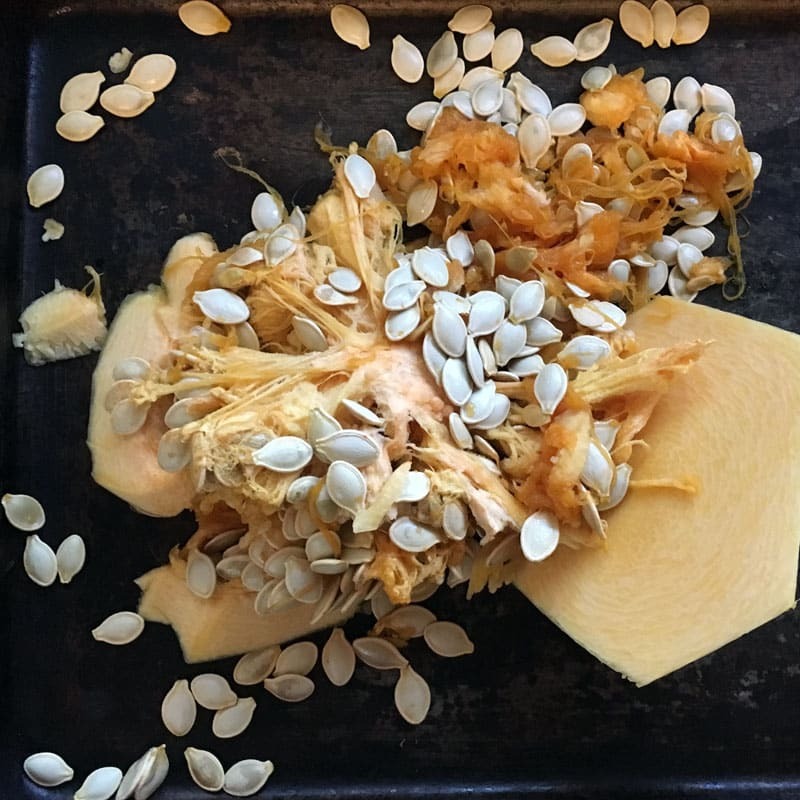 Scoop the strings and seeds from the inside of your pumpkin. Separate the seeds from the strings, either by picking them off with your fingers or by swishing the seeds in a bowl of water. Give the seeds an extra rinse to get any gelatinous goo off of them. Dry them as best you can between a couple of paper towels or dishtowels. They have to be dry so they’ll roast up nice and crunchy. Pour 1 teaspoon of olive oil or avocado oil on a cookie sheet. Spread it around with your fingers or a pastry brush. 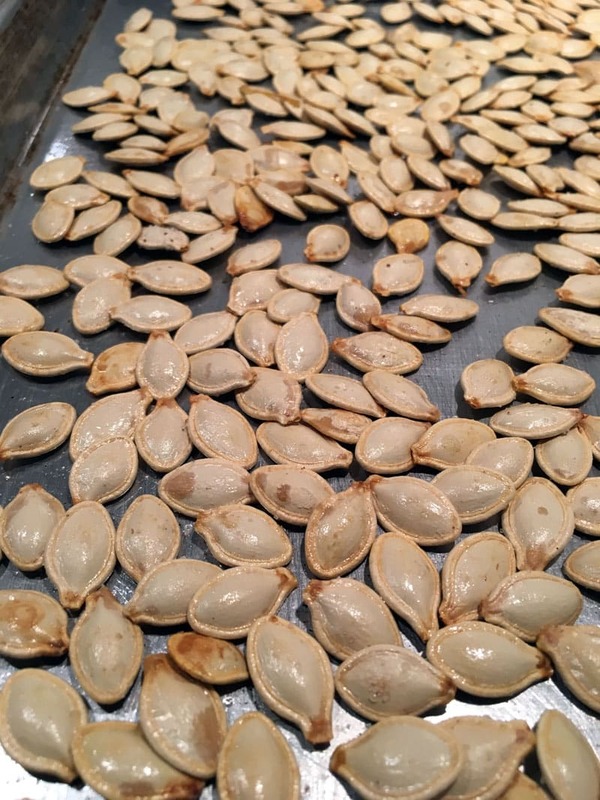 Put your pumpkin seeds on the cookie sheet and stir them gently so they get a light coating of oil. Try to keep them in a single layer without too much overlap. Sprinkle lightly with salt (I prefer RealSalt) and/or cinnamon sugar and bake at 325 for 8-15 minutes, stirring once. You want them to be lightly golden brown–too dark and they’ll taste burnt. Let them cool slightly and then start munching! They will keep in a canning jar or zip bag for at least a week, but I bet they’ll be gone long before then. 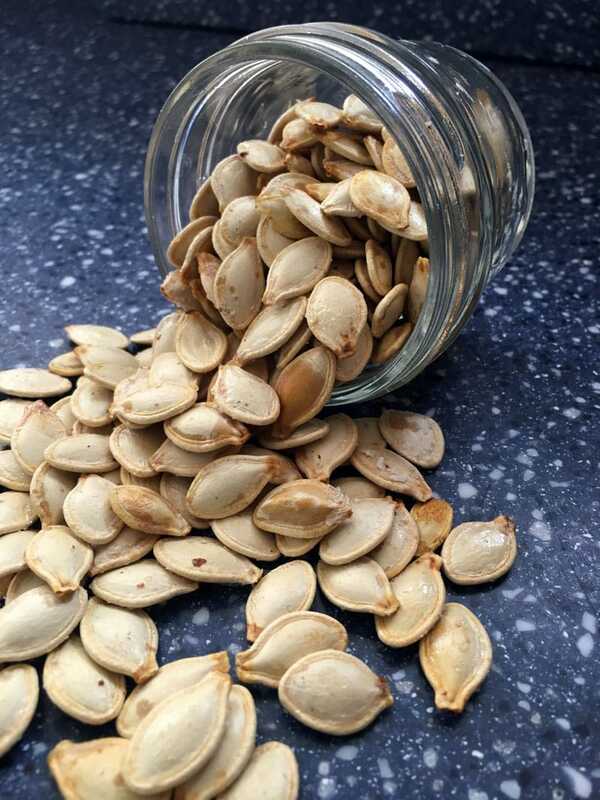 How do you like to eat your roasted pumpkin seeds?